Long before Allen Ginsberg, Jack Kerouac, and William S. Burroughs would be celebrated as the poetical and political figureheads of a ‘beat generation,’ there was a murder. In the new film, Kill Your Darlings, the crime scene sets itself at Columbia University, 1944, when a young Allen Ginsberg (Radcliffe) is introduced to the anarchic, pornographic mind of fellow student, Lucien Carr (DeHaan). Carr takes on the responsibility of being the not-so-white rabbit that leads the young poet through the literary looking-glass and into a wonderland of innovation and experimentation. The two, along with a young William S. Burroughs (Foster) and later, Jack Kerouac (Huston), set about dreaming and scheming their way, under the low lamps of the downtown jazz bar, toward a self proclaimed ‘New Vision.’ A manifesto is soon drawn up which traces the seeds of creativity to that of naked self expression, in which the artist’s consciousness is expanded by the complete derangement of the senses. Through thick clouds of smoke the ensuing scenes show pages being ripped from their roots, hallucinatory strolls through the mind, nitrous oxide, Benzedrine, morphine and all to the tick-tick-tickering of their trusty typewriter. Here lies the aesthetic of the Beat Generation, conceited and styled in stereotype. Kill Your Darlings follows Howl (2010), and more recently On the Road (2012), to the big screen as cinema continues its flirtation with the beginnings of this period in American literature. It’s a seemingly one-way romance, as the language of the Beats hasn’t always translated truthfully to the language of film. Walter Salles’ On the Road was entirely faithful to its subject matter and yet, wasn’t received well. It was missing that spark, that touch of genius that had graced the pages and inspired a post war generation to take off. It cruised along the side of its journey when it should have roared down the white line. Jeffery Friedman and Rob Epstein together delivered a worthy attempt with Howl, bridging the gap from pages of poetry to the art house. However, ultimately Howl showed the strains of being burdened by its own genius, with characters crushed by their own self-importance. Regretfully, this is also the case with Darlings. So let us begin where the film does, at the end. The bare-chested, bloodied Carr stands in dark waters, clutching the body of his victim. Making no secret of its conclusion, it’s a confusing and slightly unnecessary entrance. It brings focus on an event that, by the time it eventually does arrive, seem strangely to be no more than an afterthought. Director John Krokidas and co-writer Alan Bunn clearly have great enthusiasm and respect for the material, so much so that they don’t seem to want to head home from the party. As a result, it remains unclear as to what story is trying to be told here. Is it the study of the birth of a literary revolution, one that would go on to define their generation? Or, is it the depiction of perverse obsession and its disturbing conclusion? Perhaps it is the sexual awakening of a group of young men repressed by a homophobic society? It’s being marketed as a murder mystery but that doesn’t fit the actual story. The death of the young academic, which was later dismissed as the ‘honour slaying’ of a homosexual arrives too little too late to make much of an impact. The subject at Kill Your Darlings‘ core is influence. It’s about those that serve to inspire you and those that can cripple you. When it comes to it, have we the strength to move past influence and become our own? In order to commit to his desire to study poetry, Ginsberg must shrug off the desperate hold of his schizophrenic mother and step out of the shadow of his father’s own celebrated, more traditional musings. With his new found liberty, Ginsberg creates enough room to be reborn. On the other hand, it is Kammerer’s obsession that leads to his demise. He smothers to the point of suffocating his fixation and in doing so triggers a sinister reaction. Lucien, being a creative stimuli to his small group of friends, exerts the greatest influence. One by one the gang succumb to the power of his persuasion. He seduces in order to conquer, delegates so as to mask his incompetence. His art exists not on the page but in the life he leads. This is a theory that extends beyond the screenplay as the journey to discover a voice naturally draws parallels with the production. Here is a crop of talent on the cusps of their own careers, hoping to make their own influence. Behind the lens sits debutant director, John Krokidas. They say that you’re never more confident then when you are delivering your first feature and here it shows. Shot in and out of focus, on film and on a shoestring, Krokidas has delivered a film brimming with self-confidence, displaying all the youthful exuberance and camaraderie that he demands of his cast. Despite the film’s shortcomings, he can be assured by what success he has found in his debut. It’ll be intriguing to watch him grow and to see which avenue he chooses to explore next. As for its star, it’s an admirable choice of role for the now not-so-young Radcliffe; his transformation is convincing and his accent credible. There’s an emotional fragility to his take on Ginsberg, with an uncomfortable stare that lingers long after it’s gone. Even with the unfortunate scruffy black barnet and thick rimmed spectacles it takes him only a single (be it explicit) scene to shed the shadow of the wizarding world. Only time will tell if he has the talent to sustain a long career in the film industry. One star however, whose future is of no uncertainty is Dane DeHaan. Creeping up on audiences with his dark turn in Chronicle he has since gone on to establish himself as the hottest ticket in town. DeHaan channels a powerful screen presence as the aloof, unapologetic Lucien Carr, a character modeled more on Rimbaud than Moriarty. His swept blonde locks frame soft features that seduce all and yet darkness hangs from the rings around his piercing blue eyes. The insecurity and sexual ambiguity to the character add a tension to the delivery. It was Radcliffe who no doubt brought the budget but it will be DeHaan who will bring in the box office. 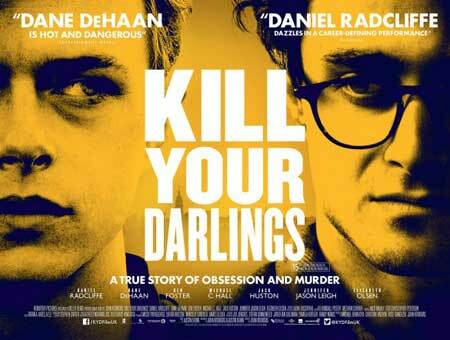 Kill Your Darlings swings to its jazz score, refusing to be pinned down. It restlessly leaps from one half-idea to the next, raising interesting questions before swaying elsewhere without answering. Fine actors are introduced as cameo characters, to then soon be dismissed. Its philosophical meditations, intended as radical, relay merely as juvenile and self-congratulatory. Like its muse, it’s erratic and unpredictable without always paying off. Despite a vast improvement on the subject, it still fails to successfully maneuver poetry in motion, leaving us waiting still. So Howl, On the Road and now Kill Your Darlings. Another Beat chapter submitted to cinema, and further evidence that the tale that needs told is the only one that hasn’t been. What would we learn if we were to be given a glimpse of the greying Beat Generation, having become underground celebrities? Give these great characters to great actors and watch them play. What if we were presented with Allen Ginsberg, now national treasure and gay activist, grown hoarse howling straight from the heart of disillusioned America? What for William S. Burroughs, having shot up and shot his wife, now a junky on the run? What of Burroughs’ erratic ramblings and ‘cut-up technique’ paving the way for a thousand-and-one rock stars? What would we learn if we were to catch up with old Jack Kerouac, off the road, once he has sought solace in both Buddhism and alcoholism? The wild boys of yesterday now lost. And what of Lucien Carr? Having pleaded guilty to first-degree manslaughter, he went on to serve a two year prison sentence. Despite remaining close friends with the circle, Carr distanced himself from the counter-culture revolution, even requesting his name be removed from the sleeve of all dedications. Just as he was there at its beginnings, a catalyst, so too was he present at its end, though wayside, watching on from the shadows. With a single strike he removed himself from the landscape, becoming a footnote to the literary eruption of the Beat Generation. Kill Your Darlings is in theatres, and will soon be released on Blu-Ray. David Meadows studied Contemporary Photographic Practice at Northumbria University where he received a BA (Hons). In addition to exhibiting his fine art photography and video installations, he writes on contemporary cinema at Stylofilm and contributes to PEEL magazine. Find him on Twitter: DavidMeadows28.